Most people learn of my football loyalties within the first ten minutes of even a casual conversation. It’s near impossible to grow up in western Pennsylvania during the 1970s without developing very specific leanings. Even fleeting personnel issues (ahem) don’t alter football heritage. 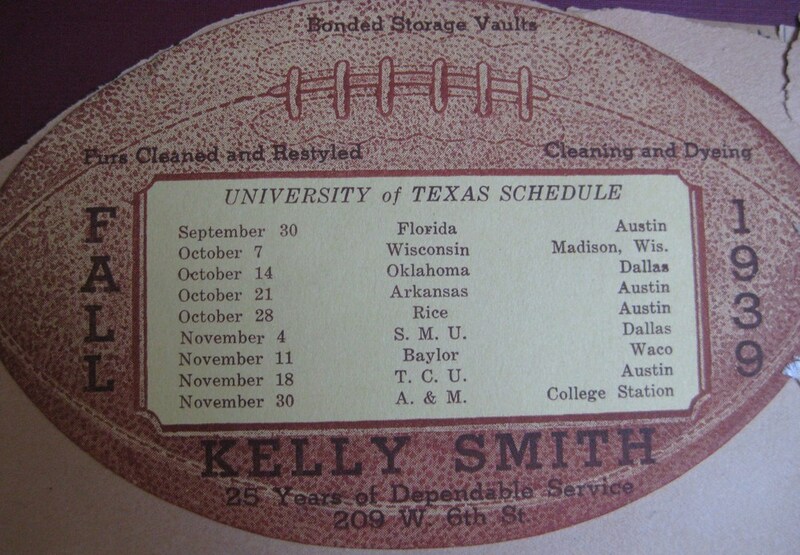 But we can also lay claim to a strong maternal football lineage – of the Texan variety. Mom was born in Sierra Blanca, Texas, but the family moved to nearby Fabens in 1932 and that’s where she attended high school. It’s about as far west as you can get in Texas. Safe to say that football was a social focal point. And I’ve got the memorabilia to prove it. 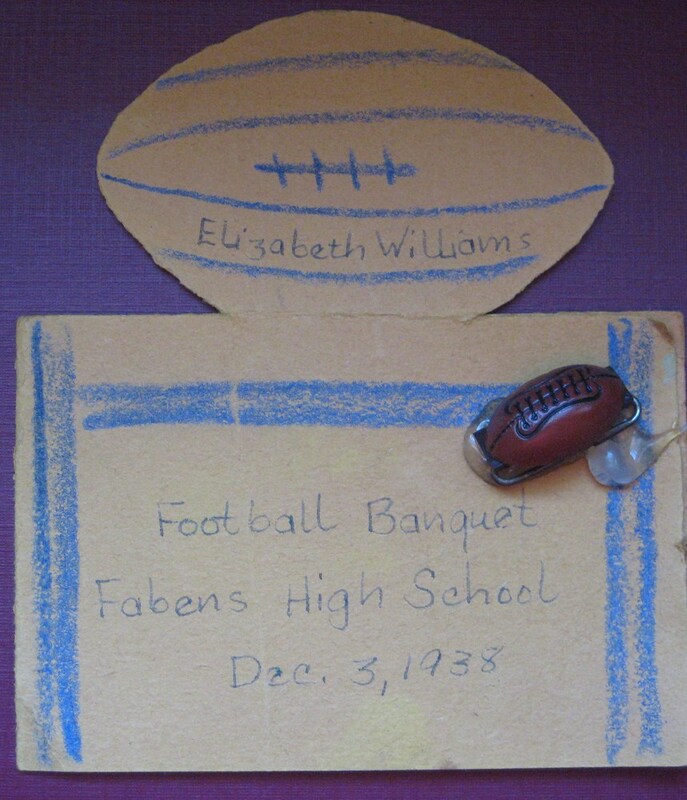 Mom was Master of Ceremonies at the Football Banquet her senior year and, I’ll bet you my last dollar, also designed the program/menu. 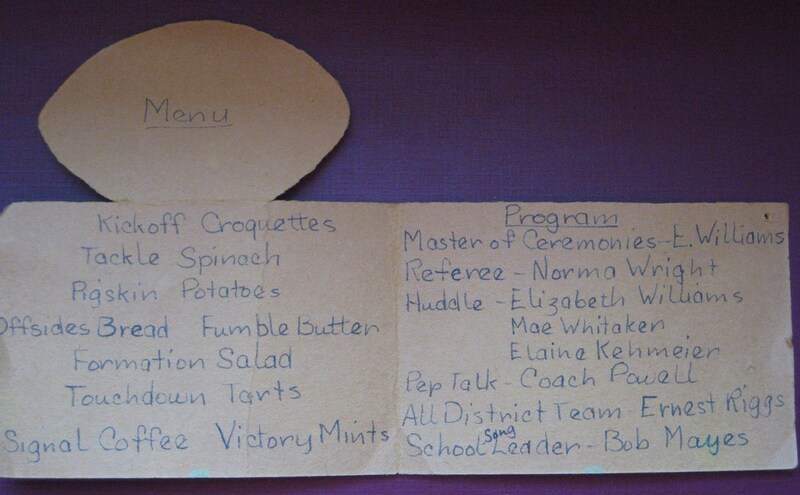 Who else could come up with “Kickoff Croquettes” and “Touchdown Tarts”? Then off she went to the University of Texas in Austin, an even bigger football stage. Now the letters from home straddled both worlds. “….You must have been thrilled with T. U. & T.C.U. game, we heard the score at the half and were kinda surprised that you won. Fabens lost and took their worst beating of the season from Iron, 36-0. 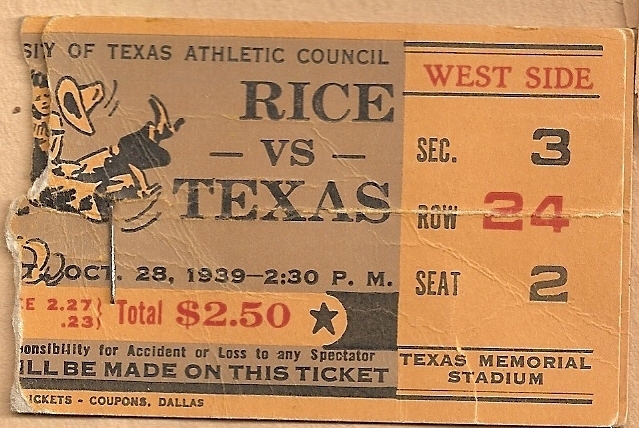 The University of Texas was a big place, especially compared to Fabens…..
And, for the occasion, Texas beat Rice, 26-12. (2) Hook ’em, Horns! 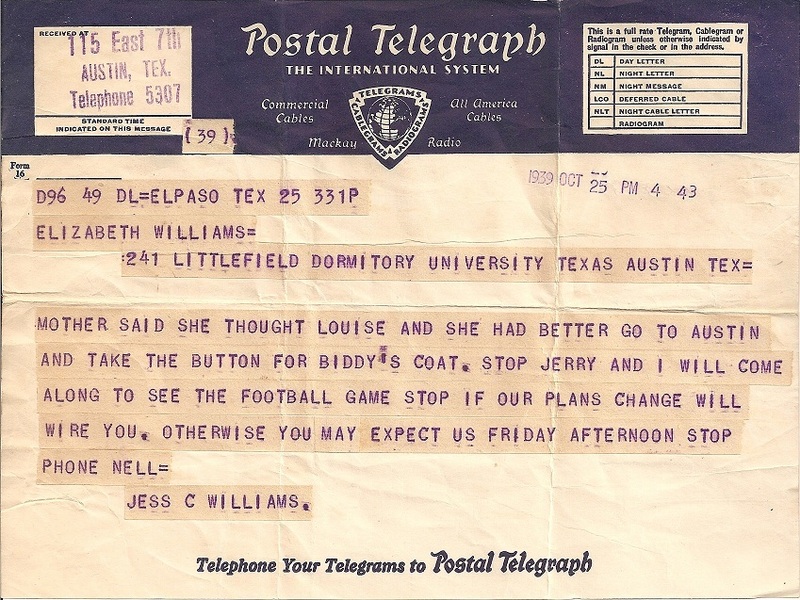 (1) Jesse C. Williams, Fabens, Texas to Elizabeth “Biddy” Ruffner, letter, undated, Williams Research Files; privately held by Malissa Ruffner, [street address for private use,] Baltimore, Maryland. We can't pin that one on Boppa! Previous Previous post: I come from Alabama….